Somewhere out in the global sprawl of 160 countries where Procter & Gamble sells its products is a 35-year-old manager who, one day, will be CEO. And the company’s current chief executive, A.G. Lafley, sitting at headquarters back in Cincinnati, is watching, focusing his attention far and wide on those bright upstarts. Overall, Lafley says he spends a third to half his time on leadership development. The company says it cannot calculate precisely how much money it spends on leadership development, but it is obviously huge. All employees are subject to 360-degree reviews beginning within a year after they start, and there are a raft of leadership development programs that span an entire career. Line managers are evaluated-and compensated-not just on their business results but also on the basis of how well they develop their organizations. The company also has a computerized Talent Development System containing names of 3,000 top executives and details of their backgrounds in order to help in identifying the right person for the right job. All of which helps explain why P&G came in first in this year’s ranking of the Top 20 Companies for Leaders, co-sponsored by the Hay Group and Chief Executive. P&G beat out several companies that have long been lionized for their leadership development such as IBM, General Electric and Johnson & Johnson. The bragging rights will be particularly sweet for Lafley because he sits on the GE board, advising CEO Jeff Immelt. While P&G and Pepsi, which came in No. 2, are known for management continuity and for promoting from within, other companies making the list this year for the first time, such as Motorola and Home Depot, have gone through cultural transformations under CEOs Ed Zander and Bob Nardelli, who came in from other companies. Results this year, the fourth year that the magazine has published this ranking, are not strictly comparable with prior years because of changes in research methodology. But it is the first time the magazine has published a consolidated list of global companies, not just U.S.-based ones or non-U.S. companies. One clear outcome: Major U.S. companies have an edge over European multinationals. Japanese and Korean companies, such as Toyota Motor and Samsung Electronics, are nowhere to be seen. One of the debates among CEOs is how to get the right balance between cultures that promote from within versus those that rely on acquisitions or external recruiting to re-energize management teams. “If you get all the talent from within, there will be a tendency toward inward-thinking over time,” says Dalziel. “But if all the talent comes from outside, it’s extremely hard to gel.” He says 20 to 30 percent of a company’s management talent ought to be from outside. Lafley is acutely aware of the risks inherent to a company’s promote-from-within policy (although he notes that because of acquisitions over the past 20 years, including Gillette, some 40 percent of the company’s managers are non-P&G’ers). The company encourages its executives to sit on the boards of other companies and to engage in professional networks. It also benchmarks itself against companies as small as L.L. Bean. P&G also has surprising internal diversity, Lafley argues, despite the popular impression that it is largely a soap and paper company. “But we are so much more,” he says. “We’re in the pharmaceuticals business, we’re in the cosmetics and fragrance business. We do over $2 billion of business in China a year. We do over $1 billion in Russia. We have so many opportunities to move our managers around, across geographies and across businesses, to broaden them. Our diversification really helps us. In terms of the techniques that P&G uses to develop talent, it does not rely on a university-like campus, such as the one GE has at Crotonville, N.Y., or Motorola has in Schaumburg, Ill., where promising managers go to spend several days at a time. P&G isn’t convinced it’s worth the money to build such a campus-like facility. Instead, the emphasis at P&G is on intense one- or two-day training sessions and then sending managers immediately back to the job. The company also says it has had mixed experience with external coaches and courses of instruction created by consultants or universities. The key to understanding how P&G does what it does is that leadership development is all-pervasive and permeates the culture. “I think the most important thing we do is that we are a continuous selection machine,” Lafley says. “We start when we recruit kids from universities. We have a process. We have an assessment tool that we use. We recruit for values, brains, creativity, leadership and accomplishment. Then every step of the way through your career here, you are assessed. I think that’s the biggest driver.” The Hay Group researchers also identified practices that work and ones that don’t. Leadership development at Home Depot, which came in eighth-making its first appearance ever in this ranking-is somewhat different, in part because that company has undergone a more sweeping cultural transformation under Nardelli. After arriving in 2000, he found a highly decentralized spawl of stores and regions with very little central coordination and command. Since then, he has attempted to keep the best people from the “old” Home Depot while at the same time professionalizing management by drawing in outsiders. Partly because of staggering growth (it opens a new store every 48 hours on average) and because of traditionally high turnover in the retail industry, Home Depot is hiring 20,000 people a year. Out of the top three layers of management, 98 percent are new to their positions within the past four years, says HR executive vice president Dennis Donovan. Of those top managers, some 56 percent have come in from outside Home Depot in the same period. Nardelli and Donovan worked together at GE Power Systems and have brought along some of their GE know-how, but they have had to develop many new tools and programs with the assistance of a staff of organizational psychologists. The Home Depot approach features a “competency model” for its high-potential leaders. Donovan and his team have researched other large companies and interviewed successful leaders internally to come up with a profile of the person who will perform best at Home Depot. One of the debates in development is the use of the 360-degree review, where subordinates, superiors and even outside business partners are asked about a manager’s performance. Should it be used only when deciding whether to promote an individual, or should it also be used for other purposes? Should it be used at all levels of a company or just at the most senior levels? Are questionnaires better or are interviews that are circulated verbatim more revealing? And how can the process be managed so that it promotes development, rather than derailing a manager’s career or being perceived as being overtly political? The Home Depot answer is to use the 360-degree tool quite aggressively. “If we’re serious about leadership, we’re going to use instruments like 360s to develop, select, reward and manage the careers of people,” says Donovan. His team has trained 500 internal coaches who manage the process. They ask questions such as, What’s the root cause of a particular behavior? Q: What’s the heart of your strategy to develop leaders? Lafley: Everything begins here with our purpose. It’s very simple. We provide branded products that improve everyday lives. The values of the company are integrity, trust, ownership, leadership, passion for service and winning. Then we have principles such as “respect for the individual” and “innovation is our lifeblood.” Every employee has one of these little pamphlets. It’s on every Web site and in almost every conference room everywhere in the world. We’re quite public about all that and we’re even, in a shorthand kind of way, pretty public about our strategy. We’re not surprising our competition. They know broadly what we’re trying to do. Then we turn to strategy, which is choices. Our whole focus has been to grow and profit from the core-and that means core businesses, core capabilities, core technologies. Our second choice was to expand our portfolio in health, personal care and beauty care because that would serve more consumers’ needs for longer lifetimes. Then the third one is to serve low-income consumers who can’t always afford our products, especially in developing markets. I say this because I live it. But I guarantee you that if you dropped into any group, anywhere, in the company, they could explain all this. Then (the other piece of this is) selecting, developing, training, teaching and coaching the leadership team. They are the leadership engine. We’ll do at least $68 billion in sales post-Gillette. We’re in 80 countries. We sell in 160. We have over 100,000 employees. It’s going to go to 130,000 or 140,000. This company is run by 20 presidents of line businesses and 100 general managers and their functional leadership that supports them. So that’s about 250 people. It’s one team with one purpose and one dream and one set of strategic choices. Lafley: We do it in two ways. By last count, and post-Gillette, 40 percent of our managers actually did not start with P&G. That’s happened in the past five years. We didn’t start becoming acquisitive until the mid-1980s with Norwich Eaton Pharmaceuticals and Richardson-Vicks. Then there was Noxell and Max Factor. The way we’ve refreshed our management pool has primarily been through acquisition. The other thing is that we do recruit from outside for skilled positions. We don’t make a big deal about it because there is value in the “promote from within culture.” The value is that we grow up together, we share values, we go through tough business challenges together, and when you’re expecting that general manager or president promotion, we don’t all of a sudden bring in the headhunting firm and the job goes to someone outside. At the top of the company, most of the top 150 jobs are a competition among P&G’ers. The other thing that helps us with insularity is that we’re so diversified. I think we’re still thought of as a soap and paper company. But we are so much more. We’re in the pharmaceuticals business, we’re in the cosmetics and fragrance business. We do over $2 billion of business in China a year. We do over $1 billion in Russia. We have so many opportunities to move our managers around, across geographies, developed and developing, and across businesses, to broaden them. I think it would be much tougher if we were just a beauty company and only operating in one major market, say Western Europe or North America. There would be a greater risk of insularity. Antoine: The other thing is that A.G. says that “the consumer is boss.” That keeps all of us focused on the outside. Then we do extensive benchmarking, all the time, of best practices of other companies. We don’t have any monopoly on good ideas. Then, finally, are the networking opportunities. Each of us is expected to participate and belong to networks. The CFO belongs to a couple of different external groups. I belong to two. These are our counterparts at other companies and you get together to talk about problems and issues. I find these tremendously valuable. Q: You’ve built a leadership team that is, on the main, internally grown, yet you’ve said to those people, find 50 percent of your ideas outside. Why? Lafley: The genesis was recognizing that the most precious thing that we have is innovation. It’s the lifeblood. Frankly, innovation leaders are industry leaders. 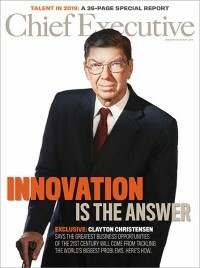 I’m hard-pressed to think of an industry where the leader over time isn’t the innovation leader. When we looked at our innovation process, we asked ourselves, “What are we really good at?” Well, we think we’re really good at developing, qualifying, testing and commercializing innovation. And we’re pretty good at the first step, which is ideation or invention. But there are a lot of other people out there who are pretty good at that. We said, “You know what? Invention can come from anywhere.” There was a lot of data that said building a bigger research lab wasn’t necessarily going to get you more invention. Or, it might get you invention, but you might miss commercializing it. Xerox had a famous research lab out in California and it did a lot of invention. Silicon Valley ended up commercializing it. For some reason, Xerox didn’t. So, we said, the model for invention in the 21st century is going to be a network. The network is going to have to be connected externally because the best idea can come from anywhere.